American Porphyria Foundation Purple Light Blog: A Microbiologist Recreated 'Starry Night' With Bacteria In A Petri Dish And it's not too shabby. A Microbiologist Recreated 'Starry Night' With Bacteria In A Petri Dish And it's not too shabby. If only Vincent van Gogh could have lived to see this strikingly accurate reproduction of his iconic "Starry Night" -- especially since, instead of oil on canvas, the work is a bacteria on petri. Because even with these most minute of materials, the night sky still swirls with a palpable momentum of wind, fog and moonlight. 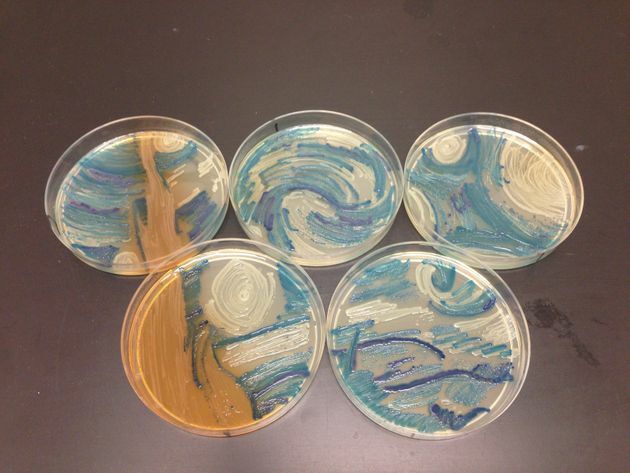 The work of science-savvy art is the product of Melanie Sullivan, a microbiologist who submitted her microscopic masterpiece to the American Society for Microbiology's first Agar Art contest. The competition invited microbiologists to get in touch with their cultural sides in more ways than one, exploring the infectious beauty of infectious bacteria. The multitalented scientists used proteins, yeast and good ol' fashioned bacteria to create visions of flowers, skeletons, butterflies -- even a map of New York City. Check out all of thestunning submissions here, and see the winning works below.